Batman star Christian Bale will not face charges over an alleged assault on his mother and sister during a row, the Crown Prosecution Service has said. The actor, 34, was arrested in London last month and questioned over claims he had lashed out at his family members while staying at the Dorchester Hotel. 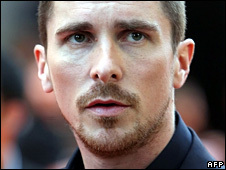 Mr Bale, who was in the UK to promote The Dark Knight, denied the charges. A spokesman for the CPS said there was "insufficient evidence to afford a realistic prospect of conviction". "The police have been advised that no further action should be taken against Mr Bale." The actor's publicist, Jennifer Allen, said in a statement that he was "relieved that this issue has been resolved and hopes to put the matter firmly behind him". She added: "Mr Bale considers this to be a deeply personal matter and would ask that the media respect both his and his family's privacy." The star had earlier appealed for privacy when asked about the incident at a press conference in Barcelona last month. Mr Bale's sister Sharon, 40, shouted "it's a family matter" at reporters who visited her home in Corfe Mullen, near Wimborne, Dorset. And a man who answered the door at the home of his mother Jenny, 61, in Bournemouth, said she did not want to comment. Mr Bale rose to fame as the child star of Steven Spielberg's Empire of the Sun. He went on to play Patrick Bateman in American Psycho, and had leading roles in Shaft and Captain Corelli's Mandolin. In 2005, he took on the role of the Caped Crusader in Batman Begins, and reprised the role in The Dark Knight.